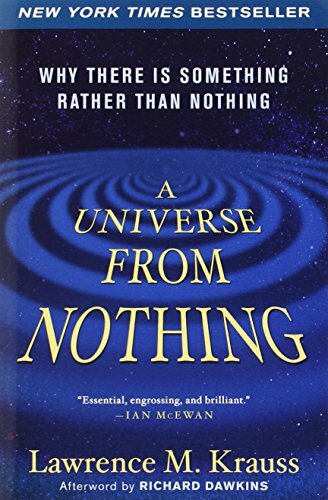 Amazon.com description: Product Description: Bestselling author and acclaimed physicist Lawrence Krauss offers a paradigm-shifting view of how everything that exists came to be in the first place. One of the few prominent scientists today to have crossed the chasm between science and popular culture, Krauss describes the staggeringly beautiful experimental observations and mind-bending new theories that demonstrate not only can something arise from nothing, something will always arise from nothing. With a new preface about the significance of the discovery of the Higgs particle, A Universe from Nothing uses Kraussâs characteristic wry humor and wonderfully clear explanations to take us back to the beginning of the beginning, presenting the most recent evidence for how our universe evolvedâand the implications for how itâs going to end. About: “WHERE DID THE UNIVERSE COME FROM? About: Bestselling author and acclaimed physicist Lawrence Krauss offers a paradigm-shifting view of how everything that exists came to be in the first place. About: Where did the universe come from?